1984 邁阿密風雲 Tony Amato 單集："No Exit"
1985 陰陽魔界 Peter Novins 單集："Shatterday"
1989 羅斯安家庭生活 他自己 單集："Dear Mom and Dad"
1989 週六夜現場 主持人 單集："Bruce Willis/Neil Young"
1997 我為卿狂 他自己 單集："The Birth Part 2"
2013 週六夜現場 主持人 單集："Bruce Willis/Katy Perry"
^ Monitor. Entertainment Weekly. March 22, 2013, (1251): 25. ^ Nickelodeon Kids' Choice Awards Press site — Kids' Choice Awards 2004. Nickelodeon. [2015-11-10]. ^ Gervich, Chad. Kids' Choice Awards grows up. Variety. 2007-03-29 [2014-09-28]. ^ The Movie: The Astronaut Farmer. visimag.com. [2015-08-25]. ^ Nancy Drew. CinemaBlend. [2015-08-25]. ^ All Time Box Office — Worst Wide Openings (1982 – Present). Box Office Mojo. [2015-11-14]. ^ James Rainey. 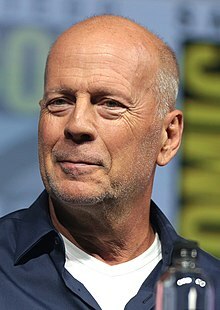 Bruce Willis to Star in Chinese-Language Epic ‘The Bombing’. variety.com. 2015-06-03 [2015-06-08].